Yes, it is the ‘who won?’ that would continue to be discussed. Not ‘how many hospitals were hit?’ or ‘total number of homes destroyed?’ or even the ‘total death toll?’ Although why would it? This is not a new war; it has been going on for almost 70 years now. Along with the usual features of war (tanks, guns, air force, ground troops, mass displacement, massacres, and of course war crimes) as seen in 1948, ‘56, ‘67, ‘73, 2008, ‘12, and now 2014, you also had continuous illegal child imprisonment, political figures assassination and imprisonment, rocket fires and suicide bombings, illegal settlement building, and the list goes on. Previously, I mentioned Thomas Hobbes, today I shall mention John Locke, who stated, “one may destroy a man who makes war upon him, or has discovered an enmity to his being, for the same reason that he may kill a wolf or a lion; because such men are not under the ties of common-law of reason, have no other rule, but that of force and violence, so may be treated as beasts of prey.” Civilians are non-combatants, thus, are not the ones declaring war; combatants are the soldiers and the mere fact that they are fighting means that they are willing to give up their lives. This is something we need to remember. Therefore, after over 7 weeks of constant bombardment of a densely populated area, we have a truce. After the destructions of: hospitals (beds and equipments lay in ruin); of places of worship (Holy Scriptures ripped across the floor); of buildings (government buildings and of NOT houses BUT homes) and targeting of UN facilities, do we see a ‘truce’. Now that we have a truce, what next? Well of course we shall see both sides demanding victory. But how does one measure victory? Israel will most likely be boasting that they have achieved their so-called objective of destroying tunnels. Yes, the very tunnels, which have suddenly become a security threat. Really? Have all the tunnels been destroyed? Wait, was this the original objective of Operation Protective Edge? One wonders that if Israel knew where the tunnels specifically lay, why was it so hard for them to AVOID targeting civilians? They could identify the tunnels, but not the four Palestinian children on the beach? Yes, many questions need to be asked AND answered. So does that mean Israel won? But of course, it is not just Israel that will be boasting; we also have Hamas here. Israel will now meet some of Hamas’s demands. Again, really? Israel will finally ease the blockade, the siege. But for how long will it last? What about all the destruction? Is it a guarantee that ALL construction material will reach Gaza as agreed? Is there a time scale? Also, what about all the political prisoners illegally arrested AGAIN without charge? What about all the civilians arrested in the West Bank and East Jerusalem illegally? Should the Palestinians trust Israel? Highly unlikely, but they definitely have damaged Israel’s image in the world stage. But how much of a difference does that bring if our OWN leaders refuse to punish Israel? With all this in mind, has Hamas won? How about the fact that the broker for this peace settlement was Egypt? This is the same Egypt that experienced a military coup last July, followed by the arrests of Muslim Brotherhood members, and sentencing of 183 members and supporters of the Muslim Brotherhood to DEATH including the leader Mohamed Badie. My mistake, Badie sentence reduced to life imprisonment but how much of a difference is it? If we move away from this topic slightly and look back to April 23rd 2014, we can see the first sign of tension, purely speculation of course, but considering the Palestine-Israel Conflict, it can be considered a sound assumption. Fatah and Hamas sign a ‘historic’ reconciliation agreement after a seven year divide; Netanyahu goes on NBC and states “What has happened is a great reverse for peace, because we had hoped the Palestinian Authority, President Abbas would embrace the Jewish states, the idea of two nation states, Palestinian one and a Jewish one. But instead, he took a giant leap backward” (is it ever going to happen? ); the US and the world (well some of them) give their blessings, Hamas did concede to the conditions after all; Netanyahu thinks ‘let’s suspend all peace agreements’ (was there any in the first place? ); and finally decides to punish the Palestinians by approving another 3,000 or so houses to be built. So these are the chain of events, open to dispute of course, but if considering this account, then we question what was Israel’s real objective of Operation Protective Edge. We need to remember tunnels were being built since the EARLY 1980s, and we ALSO need to remember that Hamas came into formation in the LATE 1980s. But this is more to do with History. Now, moving back to the ‘Final Truce’, bearing in mind the above chain of events, it seems that if Israel does not have its way and if anything affects the status quo, then of course action will be taken. Let us look at the events occurring AFTER the kidnap of the three Israeli teenage settlers in the West Bank. The world instantly blames Hamas for the crime. But wait, Hamas controls Gaza, not the West Bank. Yes, one could argue that you don’t necessarily have to be in the West Bank for the action to be carried out, but Israel admits that they KNEW where the bodies were earlier on, and Israel KNEW that it was not Hamas, initially accusing WITHOUT any evidence. I would like to bring to your attention to the day of Nakba (Day of Catastrophe), when two INNOCENT youths, Nadeem Siam Nawara, 17, and Mohammad Mahmoud Odeh Salameh, 16, were killed by live ammunition in the West Bank in May. Did Hamas fire any rockets? But when the three Israeli teenage settlers were kidnapped and killed, a revolting act of course, Israel decided to go on a rampage; illegally arresting roughly 600 Palestinians, including political figures that were involved in the Prisoner swap with soldier Gilad Shalit; damaging houses at the dead of night; and laying the West Bank in a state of siege. Did Hamas fire rockets? It was only when 15 year old Mohammed Abu Khdeir was kidnapped and brutally murdered by Israelis and his cousin, 16 year old Tariq Khdeir, beaten by the Israeli military did Hamas get involved. Provocation? We all know that if there’s a provocation, it is always followed by a reaction, it just all depends on who provokes and how serious the reaction will be. The Palestinian Ministry of Health, in collaboration with the World Heath Organization, released a report, “Ministry of Health Emergency Operation Room Sitrep on Gaza August 31st, 2014”, stating the health situation in Gaza since the launch of the large military operation from the 7th July 2014. 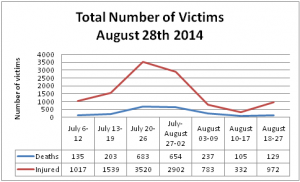 As of August 28th 2014, a total of 2,145 Palestinians have been reported dead with over 11,231 reported as injured. These include the death of 581 children along with 3,436 seriously injured. 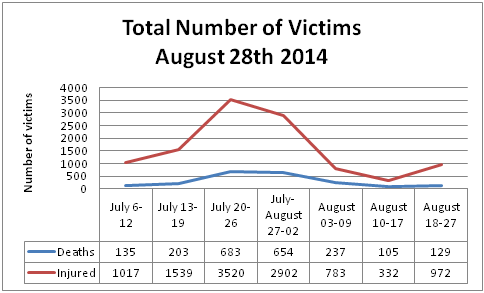 Among the dead are also the elderly totaling 102 and 486 female civilians. However, again I state, these are just FIGURES, numbers associated with each individual. I also again state, once you identify a person as a number, you dehumanise them. They lose their identity, thus, easily forgotten. However, EVEN these numbers are being questioned by the media. It’s hard not to believe that it was going to happen. If the Head of Amit Intelligence and Terrorism Center, Dr Reaven Erlich, can question the figures, stating in the Jerusalem Post, “All figures or data originated from Hamas’s ministry are not reliable,” (so only Israeli figures are reliable?) and the NGO Monitor can criticise B’Tselem for its claims of Gaza’s casualty numbers that were released for Operation Protective Edge, then it MUST be wrong. The media MUST question it. So I ask Dr Erlich, what is more important, the figures or the fact that a man, woman, child, disable and elder has been killed? Of course you can certainly call them prisoners, remember Palestinians in Gaza are living in an open prison camp (don’t forget to use the word ‘cage’), so most probably they would need to be given a number: 1, 2, 3, 4…all the way up to 2000 and above. So is this really the ‘Final Truce’? One can only hope so. The death toll of each conflict should be enough for each side to say ‘That’s enough. Let us just negotiate’! Excuse the exclamation mark, but when looking at the statistics, it is extremely hard NOT to use it. However, the pattern of events throughout history, demonstrates that this is most probably not the ‘Final’ truce. We go back to the question so ‘who won the war?’ Do we judge victory by the number of deaths? If we go down that route, then do we measure the deaths of civilians or soldiers as we know 63 Israeli soldiers were killed? The soldier is the most important figure on the group during war; a ‘protector’ on the one hand, a ‘murderer’ on the other. If considering John Locke’s argument of war, then the defender has the right to kill as he is defending his life. To work out who the defender is, then we must look at who provoked and who reacted, we must also look at who has the military might. With all this in mind, then for the defender, the number of deaths of soldiers measures victory. The attacker, therefore, will measure victory based on whether their objective was achieved. But in this case, we need to question 1. What was the real objective and 2. Realistically was it achieved? Israel’s image has been damaged considerably on the world stage. The Palestine-Israel conflict has become well known now. Hamas has agreed to support President Abbas’s bid to join the International Criminal Court. And too many Palestinians have either lost their lives or their livelihoods by the hands of the Israelis. Hamas are willing to be held accountable for their actions, will Israel? This is what the focus should be on, NOT concerning who won and no truce is ‘Final’ if no one is held accountable for their actions, the war crimes. It’s a ‘Conflict’… but you said ‘War’ Mr Netanyahu and Hamas	Tutoring/UK Elections/EU/Politics and Me!